De Beaurepaire Wines in Rylstone, south east from Mudgee and east of Bathurst and Orange, has been the quiet achiever of late – picking up national accolades, increasing its cellar door operations to 5-days a week due to demand, and having its wine stocked in some of Australia’s finest hatted restaurants and 5-star hotels. 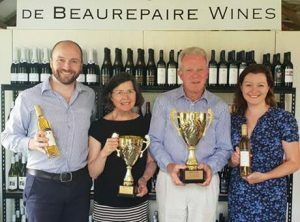 With recent developments, the family-run wine business can no longer fly-under-the radar, as De Beaurepaire Wines’ 2016 ‘Coeur d’Or’ Botrytis Semillon has been awarded Winestate Magazine’s Australian Wine of the Year Trophy and the Le Cordon Bleu Trophy for 2018 Australian and New Zealand Sweet Wine of the Year. The winning drop scored 5 stars out of 5 from every judge in the competition and surpassed more than 10,000 wines covering all regions and varieties across Australia. In nearly 40 years of the Winestate Magazine National Awards, it is remarkable that the winning wine for Australian Wine of the Year 2018 has been awarded to a Sweet Wine. Another four of De Beaurepaire wines made it into the national finals for their categories and Wine of the Year after being ranked equal best in NSW (sparkling and chardonnay) and above 4.5 stars (pinot noir and cabernet sauvignon). De Beaurepaire Wines is a family-owned and operated single-estate producer of 14 French-style wines. Best known for consistent quality across a range of red, white, rosé and sparkling wines, De Beaurepaire Wines was founded in 1998 by Richard and Janet de Beaurepaire. The second generation of the de Beaurepaire family, Amanda and Will, are now actively involved in the business. The broader family first established winemaking operations in the Yarra Valley in 1970 which is still operated by Richard’s cousin, Hugh. Commenting on the award Trophy, Richard de Beaurepaire, said “We tend not to enter many competitions, as we are focused both on-premise and at the cellar door where the experience and the personal interaction is so important. In light of this, we really value the ratings awarded by the extensive panel of quality independent judges in the Winestate Competition. “We are absolutely delighted with winning Australian Wine of the Year and it is extremely rewarding for our family and those that work with us on the vineyard and in the winery. To top more than 10,000 wines that entered the competition is incredibly humbling and we would like to thank the judges for their comments and feedback. We hope that this Award will entice more wine lovers to our historic cellar door and to also explore the excellent wines across the Central Ranges region of New South Wales”. 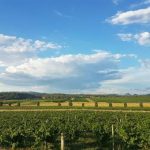 De Beaurepaire Wines is located on the hills above the picturesque town of Rylstone (50 kilometres south-east of Mudgee), through the Blue Mountains 3 hours north-west of Sydney. Starting with the first vine planting in 1998, De Beaurepaire Wines has grown into a renowned boutique producer of French-style wines. Total vineyard size is 53 hectares within a 200-hectare property with a focus on Burgundy (chardonnay & pinot), Champagne, Rhône Valley (shiraz & viognier) and Bordeaux (cabernet, merlot, petit verdot, semillon) varieties. The de Beaurepaire family originates from Beaurepaire-en-Bresse in Burgundy, where the name translates from Old French into ‘a Beautiful Hideaway or Sanctuary’ with a story that is over 1,000 years old. In exciting news, the long-awaited 2016 Leopold Reserve Shiraz-Viognier has just been released (previously awarded the Murrumbateman Cool Climate Trophy for Australia) and the first Botrytis Viognier will follow in February 2019.